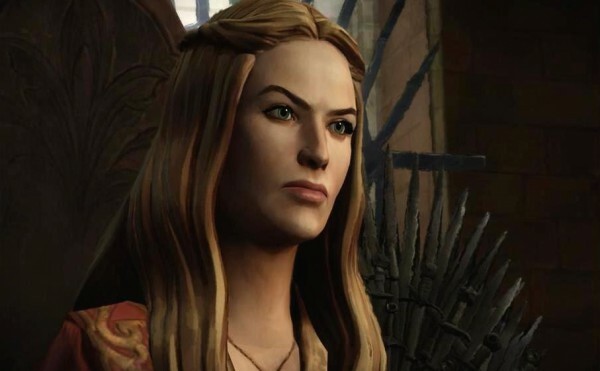 Game of Thrones by Telltale Games is a point and click graphic adventure game available for the PS3, PS4, Xbox 360, Xbox One, Windows, IOS and android devices. 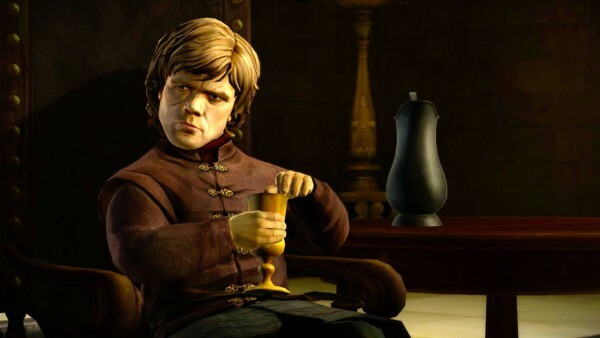 The game is based on the HBO TV series of the same name, which itself is based on the bestselling books by George R R Martin. I’ll give the layman’s backstory of the game; House Forester is a family responsible for the upkeep of a valuable type of tree known for it’s strength and value as a resource. Following a betrayal that left Forester on the loosing end of a war, the House is under threat from the local House Bolton and Whitehill who covert their trees, with the game following several individuals within Forester as they try to help their family survive. 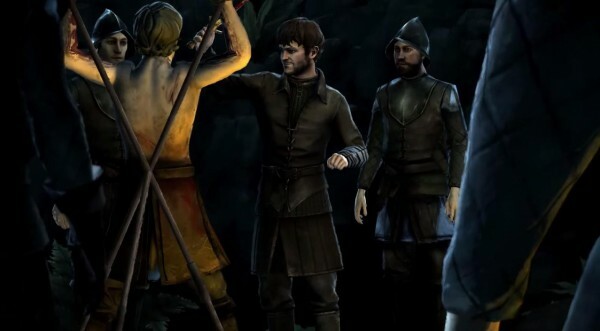 For fans of the show, the game begins with the events of the Red Wedding and follows the fourth season. As someone who has only seen up to the end of season 3 I wasn’t at a loss so I was at a good point to jump in, though if the DVD doesn’t come out soon I may start having season 4 ruined for me. If you’re looking to get into the show, I recommend watching until the end of season 3, otherwise you’ll have a lot of great twists and turns ruined for you. Gameplay is based around decision-making and plays out like an interactive movie, similar to Telltales other efforts with The Walking Dead and The Wolf Among Us, with the plot changing based on your decisions. There’s also a time pressure system in which decisions not made within a certain time frame result in silence, which people may interpret negatively, as the game is quite polite to remind you that ‘Character A’ will remember that, making you instantly regret your choice. This helps drive home your impact on the story and makes you question how the characters see you and will react to your choices in the future. This excellent story telling mechanic does well to balance out the lacklustre action mechanic, which basically comes down to quick time events. I suppose it does break up the monotony and otherwise you would be watching a cut-scene and not a very impressive one at that to be honest. For this reason I have elected not to mark this as a negative point, but it’s not getting a positive either; it works but doesn’t impress me. Artistically the game feels very Telltale-esque, if you’ve played their games in the past then the cartoonish art style and animation will feel very familiar. Its worth noting that the only telltale game I had played before this was Back to the Future, but it instantly felt familiar to me. The backgrounds and characters have a strange paintbrush feel to them, making it almost look like a painting at times. I would talk about the plot, but it’s hard to do since the story changes depending on the choices you make. I would describe the characters as likable, but that’s because they made choices that I wanted them to make. I guess the best I can do is analyze the characters you control on a design level. You control three characters; Gared, Ethan and Mira, with the actions of one affecting the other. Gared is pretty much your Luke Skywalker arch type; a farmer destined to become a great warrior and works his way up to become a hero. Thankfully it’s not completely stereotypical due to player choice, but you can defiantly see correlations. Mira is basically taking the role of Sansa from the show; she is accosted by Cersei Lannister and finds comfort in Margaery Tyrell and Tyrian Lannister. I wish they had done a bit more to make her feel a bit different though once again it comes down to player choice I suppose and it will probably appeal to fans of the series to play out situations familiar to them. 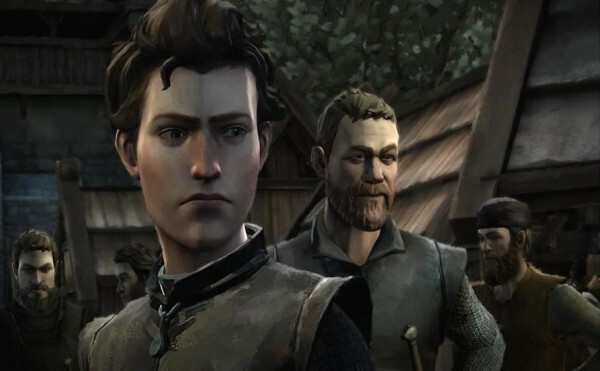 The most interesting character was Ethan, who is the young Lord of Ironrath despite being only a teenager, leaving him with important decisions on how his house should be run, with the impending armies of Whitehill coming to claim his new lands as their own. It makes me interested to see what challenges he faces in the following episodes. To summarize, the story of Game of Thrones is engaging and personal, depending on your choices of course. The situations and characters are made personal to you and does well to immerse you in the universe of the show. Don’t expect any epic sword fights, but I can safely say that I am greatly anticipating the next episode. Nothing negative in this game in my opinion; the game works as it should but the quick time events and animations won’t be winning any awards. If you like storytelling in gaming, this is a must. I will be doing a follow up review of the episodes that follow this and finally a complete review when all the chapters come out. So stay tuned for more news from Game of Thrones….can you tune into a website? I don’t care! This entry was posted in Uncategorized and tagged Game of Thrones, George R.R. Martin, HBO, TellTale Games. Bookmark the permalink. This is the only ‘newer’ telltale game I haven’t played (Walking Dead 1&2, Wolf Among Us, plus Tales From the Borderlands under my belt) and I’ve been debating whether to pick it up due to mixed reviews I’ve heard about it. Might wait for a sale and get it then. These episodic games are catching: I played one the other day called Life Is Strange. I expected to find it a blind pillager of the Telltale mechanic, but it ended up being a really heartfelt story: with some twists to the usual ‘pick a choice quick!’ gameplay. Should definitely give it a go! Hate waiting for the next parts of these things however haha.